I’ve just come across an ancient author who is completely unfamiliar to me. His name was Menelaus, and he was a mathematical writer, and one of his books even survives today, his Spherics, although only just. Let’s see what ancient sources say about him. In the Almagest (or Syntaxis) VII.3, Ptolemy tells us that he was in Rome and making astronomical observations in the first year of Trajan; that is, in 98 AD. Here are the two passages from that chapter of book 7. Page numbers are from the Toomer translation. (p.336): [Thirdly] the geometer Menelaus says that the following observation was made [by him] in Rome. In the first year of Trajan, Mechir 15-16, when the tenth hour [of night] was completed. Spica had been occulted by the moon (for it could not be seen), but towards the end of the eleventh hour it was seen in advance of the moon’s centre, equidistant from the [two] horns by an amount less than the moon’s diameter. (p.338): Similarly, Menelaus, who observed in Rome, says that in the first year of Trajan, Mechir 18/19, towards the end of the eleventh hour, the southern horn of the moon appeared on a straight line with the middle and the southernmost of the stars in the forehead of Scorpius, and its centre was to the rear of that straight line, and was the same distance from the middle star as the middle star was from the southernmost; it appeared to have occulted the northernmost of the stars in the forehead, since [this star] was nowhere to be seen. Mechir is the Egyptian 6th month, by the way, which I am told is Feb. 8th – March 9th in our calendar. “Yes, by Heaven,” said Lucius, “there was talk of this too”; and, looking at Menelaus the mathematician as he spoke, he said: “In your presence, my dear Menelaus, I am ashamed to confute a mathematical proposition, the foundation, as it were, on which rests the subject of catoptrics. Yet it must be said that the proposition, ‘all reflection occurs at equal angles,’ is neither self-evident nor an admitted fact…. Menelaus does not reply, nor speak. I picture him as perhaps being busy with the food tray. But the proofs that others have produced for the same proposition we shall recount briefly, and first the proof discovered and set forth by Menelaus of Alexandria. Some of these curves have been found worthy of a deeper study, and one has even been labelled the “paradoxical curve” by Menelaus. In his Spherics, Menelaus calls such a figure a “trilateral”. He says nothing about the setting of these arcs, because the reasoning of the demonstration falls back on the distinctions relative to their rising, and a work, on which we will later put forward some considerations, has already been written on this subject by Menelaus of Alexandria. No such “considerations” appear in the text of Pappus as it has reached us, however. But Pappus confirms that Menelaus is from Alexandria, and indicates knowledge of a lost work by Menelaus. There is a little more information about Menelaus’ books from Arabic sources, much later. By the 10th century scholars in Baghdad were translating as much of Greek technical literature as they could find. Forms of Spherics [Menelai Alexandria sphaericorum], Knowledge of Quantity in Distinguishing Mixed Bodies [De cognitione quantatis discretae corporum permixtorum]—He wrote it for Emperor Domitian. The Elements of Geometry [Elementa geometriae], which Thabit ibn Qurrah rendered in three sections; Triangles [De triangulis], a small part of which appeared in Arabic. Menelaus is among the guides of the geometers of his time, before the time of Ptolemy, the astronomical observer who mentions him in his book the Almagest. He was at the forefront for the benefit of his domain in the city of Alexandria – some said Memphis. His books were once translated into Syriac, then into Arabic. Among his writings is a book On the Knowledge of the Quantity of Specification of Mixed Bodies, dedicated to the King Ṭūmāṭiyānūs. The Elements of Geometry translated by Thabit ibn Qurrah is known to other Arabic writers. Al-Sijzī had a copy, and al-Biruni quotes from it. It is a lost book, however. The only work of Menelaus to survive is his Spherics. The original Greek text is lost. Only a few quotations survive, which were mainly collected by A.A. Bjørnbo. However a number of translations were made into Arabic, from which the text became known in the west. The Arabic tradition is complicated and is the subject of study at the moment. One reason for the complexity is that Menelaus did not give complete proofs of his propositions, but rather outlines of how they might be proven. Consequently the book was invariably expanded and “rectified” by translators or editors in Arabic, in order to make the book actually useful. The result is that a number of versions exist, and the relationship between them is unclear. Krause in the 1930’s edited and translated into German the edition by Abu Naṣr Manṣūr, and Rani Hermiz translated it into English. I understand that a revision of this was printed in Hyderabad.. A portion of a very early translation, differing from all the others, plus the edition of al-Māhānī/al-Harawī, has recently been edited and translated into English by Rashed and Papadopoulos. A Hebrew translation made from Arabic exists. There are 8 manuscripts of this. Two of them attribute the translation into Arabic to Hunain ibn Ishaq, the famous translator; the other six attribute it to Ishaq ibn Hunain, his son. But the actual text of the Hebrew translation is based on more than one of the Arabic editions, not on whatever Hunain ibn Ishaq may have produced. There is also a medieval Latin translation by Gerard of Cremona, but this also is based on a mix of Arabic editions. 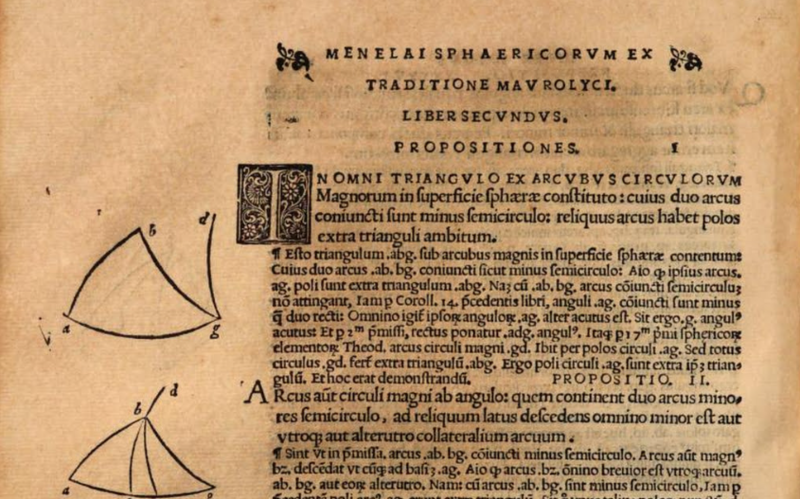 The Arabic version was translated for the first time into Latin by Francois Maurolyc, and printed at Messina in 1558, in a work containing also Latin versions of the Spherics of Theodore and the treatise “Of the movement of the sphere” by Autolycus. This was reprinted at Paris in 1644 in a work by Fr Mersenne, and then with the 2nd edition of the Greek text of Theodosius by Hunt, at Oxford in 1707. The English astronomer Halley, the discoverer of Halley’s Comet, produced two Latin editions of the work at Oxford. These were based upon the Hebrew and the Arabic versions, both of which were accessible in manuscripts in the Bodleian Library in Oxford. That’s all I have on Menelaus, perhaps a famous man in his own day and now hardly known. Only his Spherics has survived. Let us hope that perhaps a copy of the Elements of Geometry lingers somewhere, in some unexplored eastern library. It was a “religious library” in Meshed in Iran that proved to contain an Arabic version of Galen’s On my own books, so discoveries may yet be made. It is interesting to reflect that, when Menelaus was taking his observations in the capital of the world, and chatting with Plutarch, the apostle John was still alive. Doubtless neither Menelaus nor his important friends had ever heard of John. But it was John who changed the world. It’s a reminder to us, not to take the valuations of our world at face-value.